Home improvement is all about making the home a place that fosters relaxation, joy, and ultimately happiness. While there are a multitude of things to remember when improving your home, it is critical to keep color in mind. Colors have been scientifically proven to have psychological impacts on people, with different colors having different effects. Because of this, color can be used as a tool to create desired atmospheres or feelings in your home. 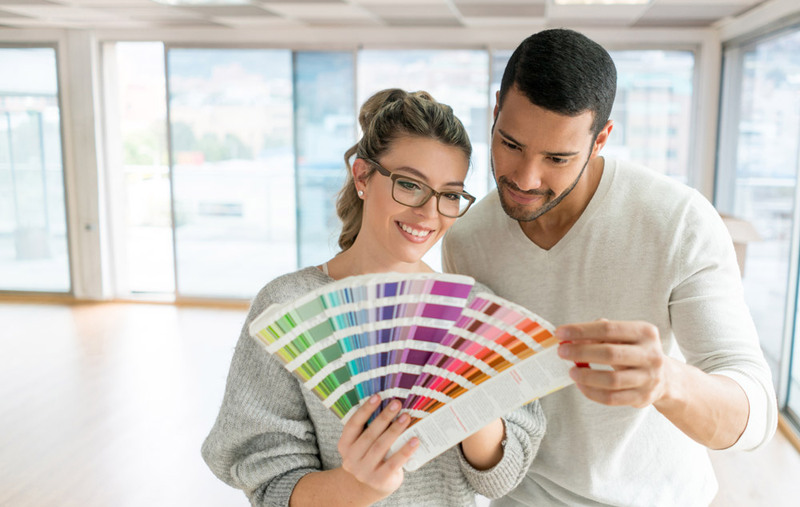 While it may seem like a good idea to pick your favorite colors to put in your home, it’s crucial to recognize that those colors may actually have effects that work against the goal of a room. For instance, colors like orange or red can stimulate hunger and excitement, so they won’t work well in a bedroom where the primary objective is relaxation. Conversely, you don’t want the lavender paint on your dining-room walls putting your dinner guests to sleep. By knowing the different impacts of different colors, you will be able to get precisely what you want from the rooms in your home. White is typically associated with cleanliness, which is why it is so popular for bathrooms. Sometimes it can create an environment that feels too sterile, making it an unlikely option for living rooms and dining rooms. Also, because of its clean and modern look, white can be utilized to make other colors stand out. Blue is a great idea for places like the bathroom, office/study, bedroom, or even the living room; the color blue creates a comfortable, peaceful, calm setting. Blue can also help to maintain concentration, lower the heart rate, and boost productivity. Blue is ill-suited for areas like the kitchen or dining room because it can curb appetites. Dark colors, like brown, can make a room feel cozy, homey, and inviting. Because brown tends to be associated with warmth, it’s a great color to use in the kitchen, dining room, or living room. Brown can also convey age or stability, and a great way to include brown is through dark wood flooring and/or furniture. Brown is, however, an unlikely choice for the bathroom. Because of its associations with tranquility, healing, and peacefulness, the color green is a great choice for the living room and the bedroom. Green can also symbolize balance and harmony, and it goes great with many other colors. Lighter shades of green can also really improve a bathroom, and yellow-greens or blue-greens can make a workout area or office space feel happier. Yellow has been shown to stimulate thinking and improve metabolism. Lighter shades of yellow are a good idea for the living room or bathroom. The bedroom is not a great setting for yellow, as it can be stimulating and overwhelming. However, it is important to keep in mind that yellow, used correctly, can greatly brighten up a room. Pink is soft, soothing, and warm, which makes it a good candidate for the bathroom or bedroom. Light pink works well in the bathroom because it can create a healthy glow for many skin tones. Pink can also be utilized as an accent color in the living room, providing contrast with a darker main color. Deeper shades of purple work well to create a relaxing environment in the bedroom. The color purple also carries connotations of royalty and creativity, making it an option in living rooms and offices. Last but definitely not least, black is the most powerful color you can use in the home. It can come off as sleek and edgy but can also seem too brooding or depressing. Used in moderation, black can add some elegance to your home.